She has such natural beauty, she could pass for a movie star. She smiles, her demeanour relaxed. In normal times, this young woman would surely have enjoyed a bright and happy future, perhaps with a husband, children, grandchildren. But soon after this photograph was taken, she would face almost certain death. 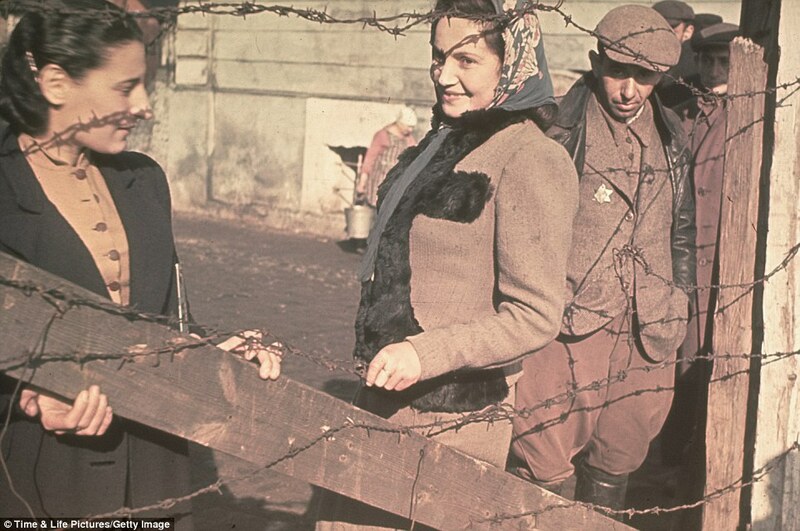 The haunting image is one of a series depicting Jews in Nazi-occupied Poland before they were rounded up to be sent to the gas chambers. The clue is the curled-up piece of yellow cloth the unknown woman wears on her lapel  a makeshift Star of David. 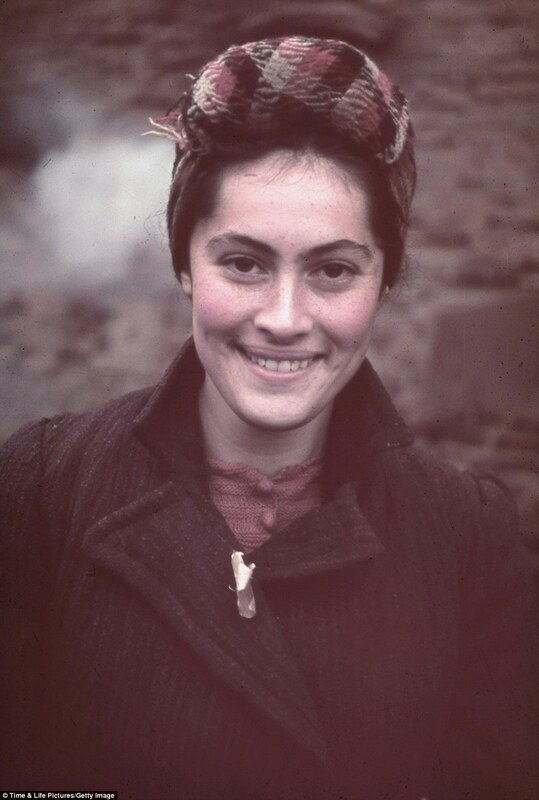 All around her, and in other photos taken in the ghetto into which the Nazis corralled their prisoners, every man, woman and child was forced to wear one. In peacetime, the six-pointed star was a proud symbol of Judaism. In the Holocaust which Hitler was about to unleash  here in the devastated town of Kutno  it would become their death-star. 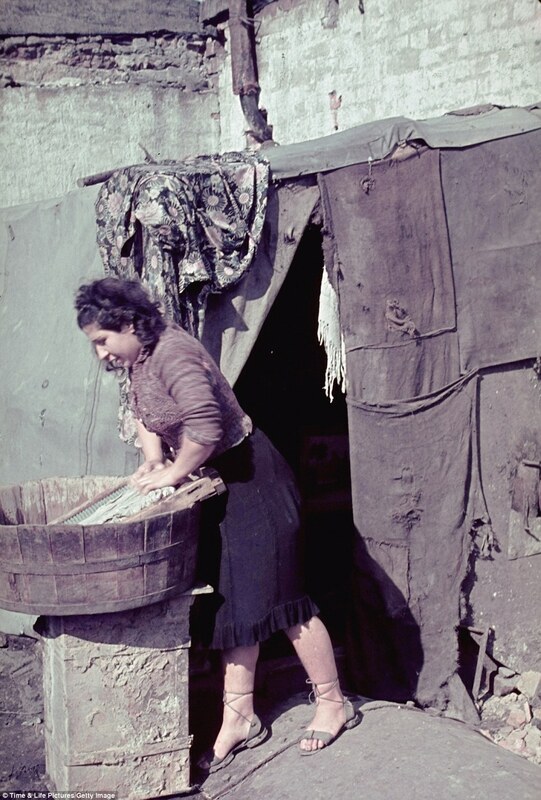 THE REMARKABLE COLOUR IMAGES were taken by the Führer's personal photographer, a loyal follower given unprecedented access to the Third Reich's elite. Hugo Jaeger was allowed to travel with Hitler to record his appearances at rallies, intimate parties and in private moments. More usually he dedicated himself to lionising his leader and what the Nazis regarded as their most triumphant moments. Here, it appears, he seems simply to have been fascinated by faces from a different faith in a country under siege. He is said not to have shared Hitler's unqualified hatred of Jews. Hence, whether he intended it or not, Jaeger's camera captured an atmosphere rarely seen before horror and carnage overtook it. AFTER SO MANY YEARS, it is impossible to know for certain why so many people in the photographs are smiling. None appears to have been forced to pose, none seems to display any fear. The trilby-hatted man in the coat with a fur collar, for example, seems quite comfortable in the company of German officers. 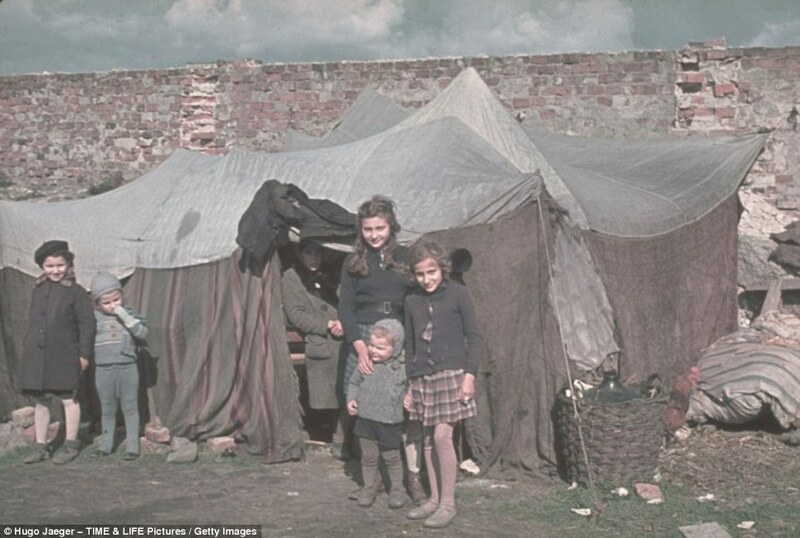 Children in the squalor of a tented village appear unperturbed by the photographer. 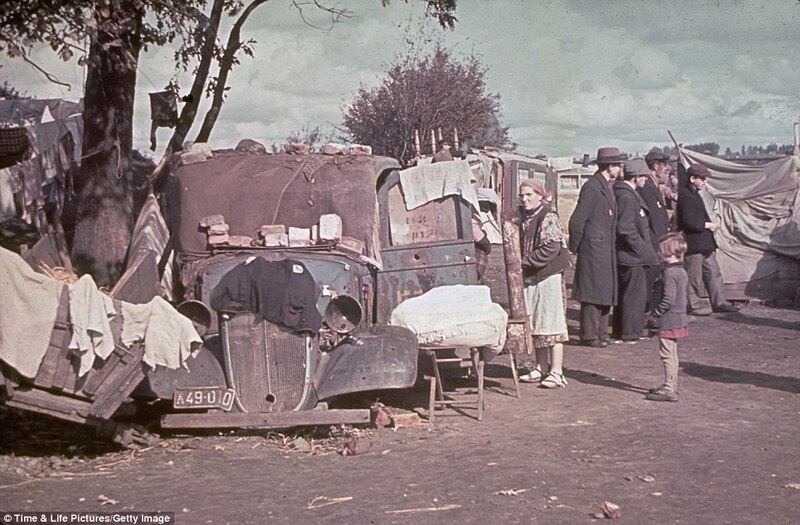 Yet Kutno, 75 miles west of Warsaw, had been bombarded and turned into a ghetto soon after Hitler's invasion in September 1939. Its sugar factory would be surrounded by barbed wire and used to imprison 8,000 Jews, crammed into appalling conditions. Some would die of infection or starvation. Others would not live through the bitter cold of the winter. 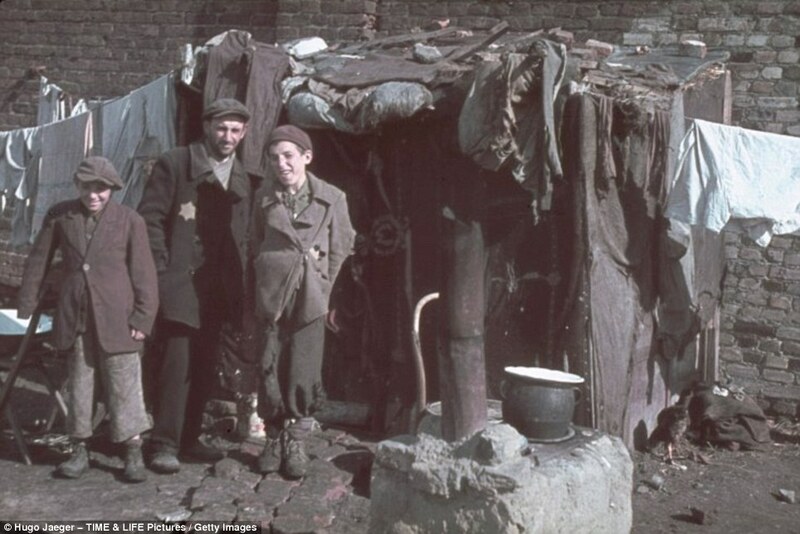 The ghetto existed until 1942, when most of its surviving inhabitants were sent to death camps. IT IS HIGHLY UNLIKELY ANY OF THE PEOPLE in these images survived. Incredibly, the photographs did. 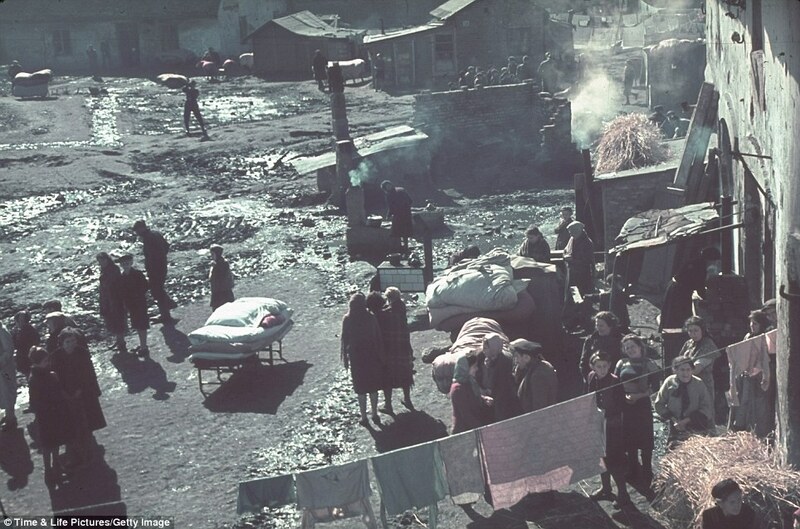 The Kutno ghetto was 'liquidated' as part of the Final Solution in the spring of 1942. 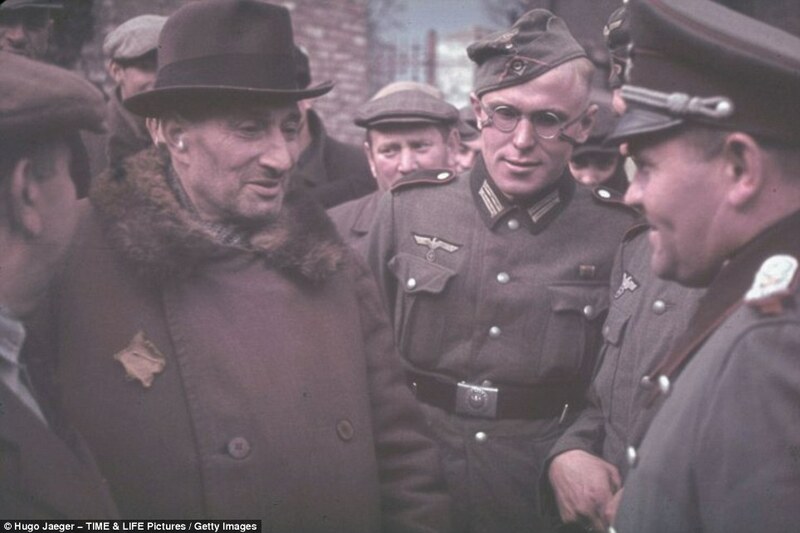 In 1945, as the Allies advanced into Germany, Jaeger knew he would be arrested and tried as a war criminal if he was caught with so many intimate photos of the defeated Führer. So after secreting them, initially in a leather suitcase, he buried them in airtight glass jars outside Munich, returning from time to time to check they were safe. Two decades after the war ended, he sold them to Life magazine. Now the pictures have gone online at Life.com. Despite attempts to identify some of the subjects, no record was ever found of the smiling young woman. Historians said it would be astonishing if she had survived. At least the camera immortalised her. 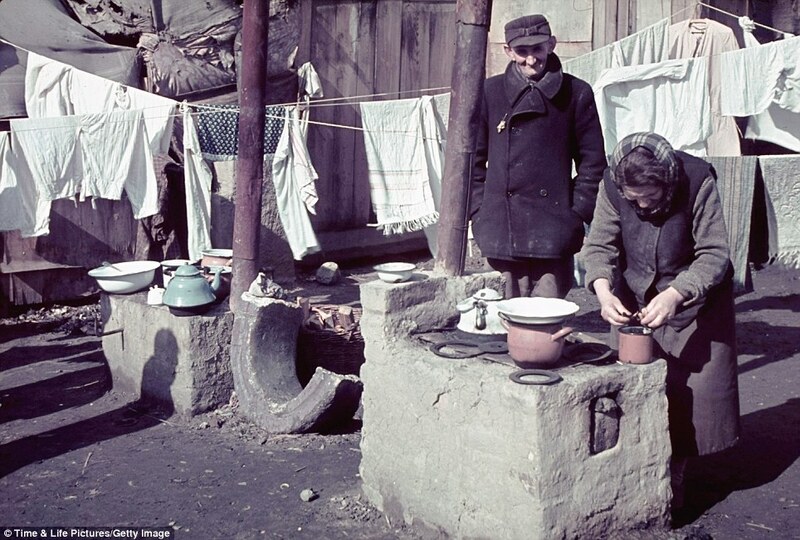 http://life.time.com/history/world-war-ii-color-photos-from-nazi-occupied-poland-1939-1940/?iid=lf|latest#1. Justyna MajewskaJustyna Majewska, who works as a curator at the Holocaust Gallery in the Museum of the History of Polish Jews in Warsaw, wrote this Foreword to the article. 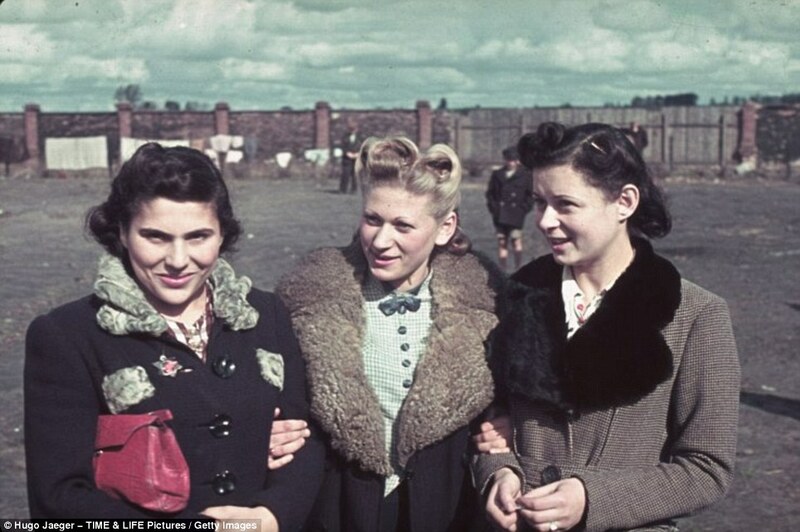 Why would Hugo Jaeger, a photographer dedicated to lionizing Adolf Hitler and the "triumphs" of the Third Reich, choose to immortalize conquered Jews in Warsaw and Kutno (a small town in central Poland) in such an uncharacteristic, intimate manner? Most German photographers working in the same era as Jaeger usually focused on the Wehrmacht; on Nazi leaders; and on the military victories the Reich was so routinely enjoying in the earliest days of the Second World War. Those pictures frequently document brutal acts of humiliation, even as they glorify German troops. In June 1940, all of Kutno's roughly 8,000 Jews were forced into the ghetto — the grounds of an old sugar factory. Typhus and hunger soon began killing hundreds of them. In 1942, the Nazis implemented Operation Reinhardt, which effectively put in motion the Nazi's planned destruction of all Polish Jewry. 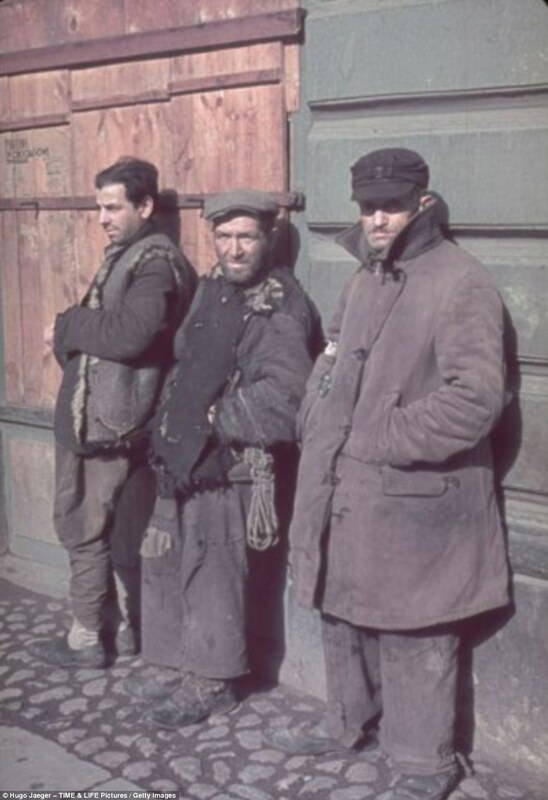 In the spring of 1942 the Kutno Ghetto itself was "liquidated." 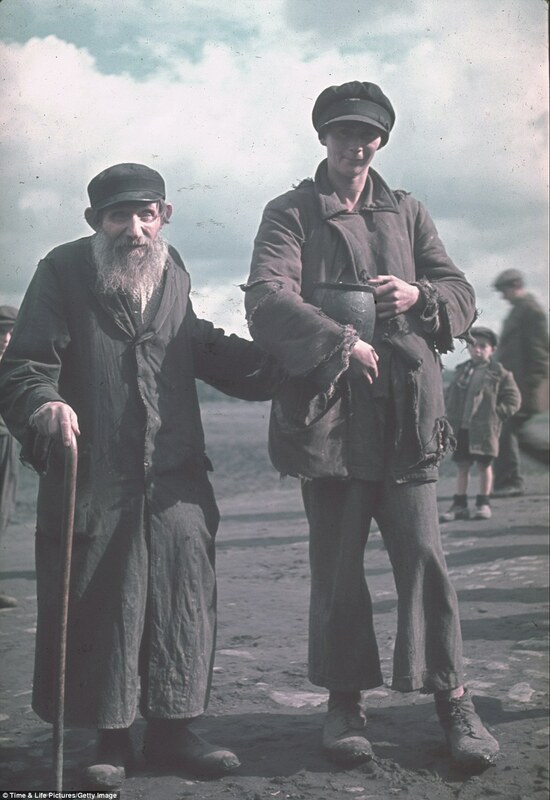 Jews who were unable to escape and find help among their Polish neighbors were taken to Kulmhof (Chełmno), the first death camp, located on the River Ner not far from the city of Lodz. There, thousands of Kutno's Jewish men, women and children were put to death in "gas vans" — mobile gas chambers — in what were among the first mass murders of the Holocaust. All these many years later, Jaeger's pictures from Warsaw and Kutno are still so hard to look at — and hard to turn away from. I presume that the beautiful young girl seen smiling directly, confidently, at the camera (slide #1 in this gallery) is Jewish: on the collar of her coat, we see what is evidently a folded, yellow Star of David. Neither she, nor Jaeger himself, could have truly, fully foreseen her fate: to die of typhus, or to starve to death, or to be forced into a gas chamber at Chelmno, only to emerge again in a haunting photograph long, long after she was dead.